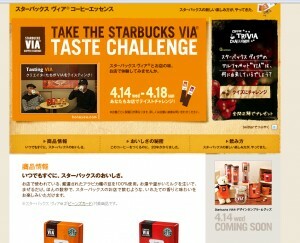 The high quality coffee in an instant, Starbucks Via Ready Brew, launches in Japan Wednesday, April 14, 2010. Japanese customers finally get to try and experience this amazingly easy and versatile instant coffee. My favorite use for it is still to mix it with a bubbly water in the summer for an amazing iced drink. Vanilla Bean Dry Soda and Via Ready Brew mix perfectly together to make a great summer treat! Of course, I don’t speak Japanese but it looks like that in Japan, they will be doing some sort of Via taste challenge in the stores from the 14th to the 18th. Also from the Starbucks Japan page, it sure looks like Via Ready Brew launches with some great merchandise to go with it. 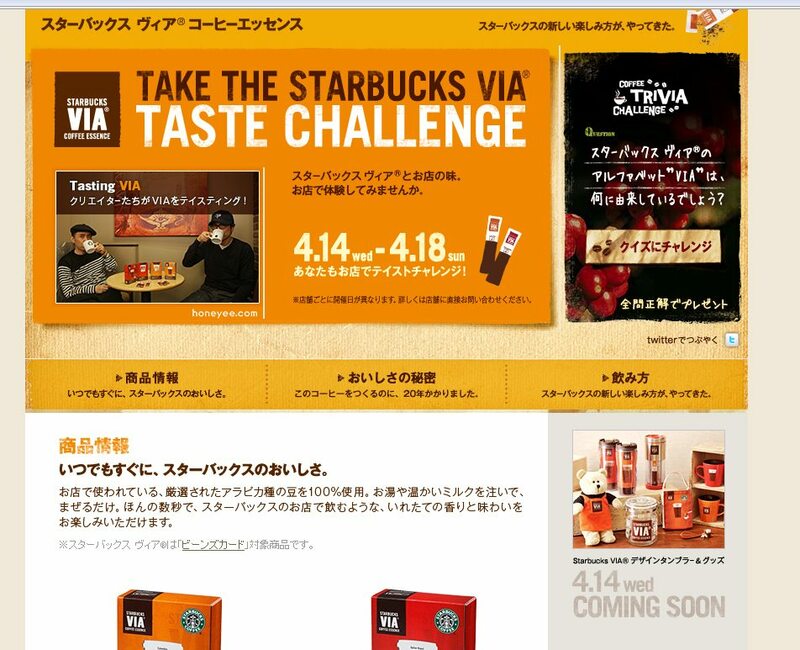 Notice the Via Bearista Bear featured on the Starbucks Japan homepage! Again I am so jealous of the international markets! That little Via Bearista Bear is sooo cute!!! Look at that adorable orange Via apron. (Screen cap of the Starbucks Japan home page used as the image icon for this blog post). I’m writing you today from Tokyo, where we are launching Starbucks VIA® in 870 Starbucks stores in Japan. I am joined by other members of the Senior Leadership Team (including John Culver, Arthur Rubinfeld, Annie Young-Scrivner, Vivek Varma and Mary Wagner, our new svp, Global R&D) for this exciting milestone for the company following our successful introduction of Starbucks VIA in the U.S., Canada and the United Kingdom. This is our third stop in a four-country visit to Asia. Over the weekend we were in Korea to tour stores, meet with partners and sit down with our joint venture partner, Shinsegae Group. We have been in the Korean market for more than 10 years, with 3,500 passionate partners serving more than 120,000 customers every day in 35 cities. The vibrancy and optimism in Seoul was incredible. Our stores were extremely busy, reflecting our status as the number-one specialty coffee company in Korea. We hosted a fantastic Open Forum, where I had a terrific conversation with a group of store managers and store partners. I am very confident we will continue to do well in Korea. Our partners give me that confidence. Prior to Tokyo, we spent two days in Shanghai touring stores and meeting with our Starbucks Regional Support Center partners. We have long said that China will be one of our largest markets, and this trip once again reinforced that notion. Shanghai is booming. The city is preparing for the World Expo opening in May and Starbucks has three new stores in excellent locations, ready to welcome visitors to the World Expo. Our team in China is ready for the many international and Chinese customers that will descend on Shanghai over the coming weeks. The Starbucks Experience is alive and well in Shanghai. I was impressed with the local innovations we have made across our food and beverage offerings and the roadmap of innovation and growth the China team is leading. We hosted an Open Forum and it was great to hear first-hand the remarkable work our partners are doing in China. We had the opportunity to see our Shanghai partners in action at the Shanghai World Financial Center Store, a store at the base of the tallest building in “new” Shanghai. We also visited the Bing Jiang Store located on the Pu Dong side of the Huangpu River. The stores looked amazing and, true to form, our partners in Shanghai are rising to the challenge, providing legendary service, warmth and energy to the many customers enjoying the Starbucks Experience. After Tokyo, we will travel to Hong Kong to celebrate its 10th anniversary. We have a fantastic day lined up in Hong Kong, a unique, trend-setting metropolis where we have more than 100 stores in key areas all over the city. As I sign off on this note, I want to thank you for all your hard work and accomplishments. It never ceases to amaze me how our company is so global but at the same time local … touching communities near and far with the original, fresh and consistent experience our partners provide. As we round the corner on this Asia trip, I return to the United States with even more optimism about the future of our company and my faith in all of you. Thanks for reading and for all you do each and every day. Free brewed coffee at Starbucks on April 15th (Coming to your local Starbucks this Thursday)! I like how Howard signs his letters with “onward”. I’m going to start doing that! Hey, I’m glad to see VIA products being available in Japan. I’ve tried VIA and absolutely love it for those days when I work in the office. It sure beats office brew and when you can’t run to a SBUX it fits the bill! Way to go SBUX. I will go to Starbucks to do Via taste challenge later. Japan does not yet sell Via Italian roast Decaf. I asked the Starbucks Japan office about the reason. “We do not have the idea at all” She said…….. Anyway, Starbucks Japan releases Via today. Thank you. Does anyone know when Via when arrive in grocery stores? I love it (particularly for outdoor adventures when you need it on the go) but don’t have a Costco card. I’d love to have it at the local Safeway or QFC. I saw VIA for sale at CVS. Eight packets for $8.99. We actually offer a better deal in-store on 12 packs. I thought for sure grocery would underprice us. Oh, I meant to mention, they only have the Colombia – Medium at Costco. No selection beyond that, but if it’s what you like it’s at a good price. I have to confess, I’m much more jonesing for Japan (I love the country) than Starbucks. Of course, I am in the process of drinking a venti dark cherry mocha and I have VIA on my desk available whenever, so I don’t have any reason to be jonesing for Starbucks. P.S. Heidi – you … could get a Costco membership. 🙂 It’s $50/year, if I recall correctly, but that’s easily amortized in savings. Can I tell you how much I love those little VIA packs!!! Keep them everywhere…… at the office, in my purse, at home, even on my boat. Melody, I love your summer drink idea and can’t wait to try it. Thanks. It’s really great to see VIA packs being sold in Japan, Starbucks have an advantage there because of the big population and thanks to the lots of people who drink Coffee. People who are busy which is generally what the environment is like in Japan will thank the new VIA packs for fast and easy way for Coffee. I think Starbucks are doing well and are looking for big success in the future! I also really like your blog! Keep it up! @Nob – Decaf didn’t launch right away in the initial rollout either. Perhaps the idea is to limit it to two offerings initially to build the brand on a simpler footprint. Then plant the idea of “decaf coming soon” as a buzz builder? Via is not my cup of tea. I’d rather go the old-fashioned route every time. Not a huge fan of K-cups, either. So, thanks again for the heads-up on the free brewed coffee tomorrow. I’ve posted it on Twitter and Facebook. Just speading the (welll-caffeinated) word! ah, I love the via bearista too! I finally caved, and gave the Columbia VIA a try. As much as I’d like to be snarky about it, the coffee actually produced the rich full bodied flavor you’d want. While not overly intricate in the flavor department, the result was very satisfying. I’ve used Via in making cookies (‘Hermits’) – turned out quite good!